Are You Suffering from Mysterious High Blood Pressure? Are there types of high blood pressure where medicines and diet control won't work at all? Yes, there is! Nowadays, you hear a lot of people who are being carried to an emergency treatment for cerebral apoplexy (stroke caused by high blood pressure), but treatment by medicines or diet controls does not work for them. What is wrong? Isn't it just the same high blood pressure? Why no medicines or non-salt diet will work at all? Regardless of their lifestyles, works, and ages, even healthy-looking people can suddenly collapse due to cerebral apoplexy. With this mysterious high blood pressure, your risk of having a stroke is much higher than the usual hypertension. The most horrifying part is that it is indistinguishable from usual hypertension. Many people are trying to take the most expensive anti-hypertensive medicine without knowing the true cause of their mysteriously high blood pressure. What Causes This Mysterious High Blood Pressure? If you experience sudden spikes in your blood pressure without any known cause, then you might have troubles with your "adrenal gland". Yes, it is difficult to find the root cause of your mysterious high blood pressure when you only undergo a simple general medical checkup. Take note that salt intake, diet control, exercise, and taking anti-hypertensive medicines will have no effect on this condition. Why on earth would this be happening? According to a survey gathered on people experiencing mysterious high blood pressure, their left adrenal gland, or right adrenal gland, or both, have gone impaired. 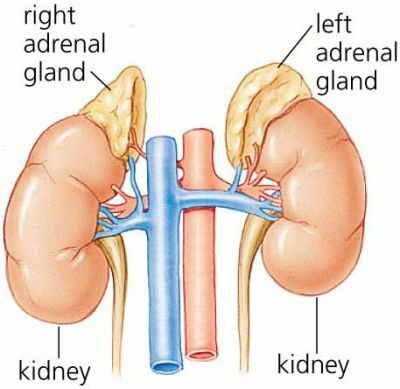 Although the adrenal glands may look like a part of kidney, they are a completely different internal organ. We then found out that the cause of high blood pressure is coming from a hormone secreted by the adrenal gland called "aldosterone". The main function of aldosterone is to help regulate potassium and sodium levels, and water balance in the body, which also causes your kidneys to retain salt. However, patients who suffer from the mysterious high blood pressure show increases in aldosterone levels. This result to increased blood volume because the sodium in your bloodstream holds water, therefore, causing raised blood pressure. We understood that the trouble comes from malfunction of adrenal gland. When the adrenal gland has a tumor or tumor-like wound or injury, the mysterious high blood pressure will occur. Of course, early detection through blood test is recommended. A simple pinhole size of surgical operation for the removal of tumor or cyst can be possible. Examining the blood is the best and fastest way to diagnose this disease. On a side note, you may notice that your blood pressure reading varies each time you check your blood pressure throughout the day using sphygmomanometer like the photo above. This is natural. Measure it for several times, and find the average. It is because blood pressures vary depending on several factors like activity and diet. 1. "Lower Your High Blood Pressure Naturally Using a Towel"
2. "How to Prevent Stroke Caused by Undetected Hypertension"
3. "Grow Your Own Sweet Potato and Lower Your Hypertension"
4. "Vinegar for High Blood Pressure or Hypertension"
5. "Relieve Your Hypertension Problems the Easiest Way"